The proposal, the ring, the engagement party, the bachelorette party, the wedding. All that proper behavior. Isn’t it time for the ladies to cut loose? To stop smiling and start screaming! Enter Velvet Rope. Your personal VIP Host will handle all the details like transportation, hotel reservations, and restaurant reservations. This is where Velvet Rope excels. Our skilled VIP hosts will smooth the way for you all night long straight into breakfast. VIP hosted entry into the hotel you want, the restaurants you want, and of course, the night clubs. What better way to say goodbye to the single life. Whether you’re the bachelorette or you’re a friend helping to plan. You’ve found the right source and overly qualified planning experts with Velvet Rope. 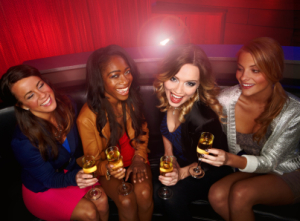 Being one of the most popular nightlife hosts in Las Vegas, we have access and experience with the hottest nightclubs, adult shows and male reviews this town has to offer. Limousine Pickup: Stretch limousine (black or white) pickup for your entire group, from your hotel. Admission: In to the #1 male revue in Las Vegas: Olympic Gardens(OGs) Men of Olympus. Inside: A private table and three (3) free drink coupons per female guest. After: Limousine ride and admission into the nightclub of your choice. Pricing: Starts at $35.00 per person. *With early enough reservations, we may also be able to arrange for free drinks or open bar for your group when you arrive at the next nightclub of your choice. Take it all in as ripped men dance on stage, at your table, and on you, just for you and your group of girls. The all male adult shows in this town are awe inspiring and are aimed to please. There are several male reviews that will satisfy your craving for eye candy and attention. However, if you’re looking for something different, Stripper 101 will teach you and your group of bachelorettes how to use a stripper pole to instantly grab your audience’s attention.